As a worrywart for many years, I developed severe insomnia. Karol’s book, “Worried Sick,” has helped me to overcome my insomnia. She gently rocks you to sleep with her expert knowledge and common sense, as she reveals the futility of worrying so much that it affects your sleep and health. The book, Find Your Inner Voice, is great. As an coach, therapist and workshop leader, this book as a wonderful resource for both clients and anyone who would like to get to know their own bodies. The step by step instructions make this sometimes illusive journey, easy to navigate and fun! 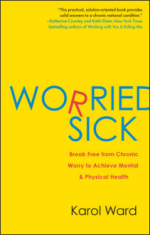 Worried Sick is filled with information you can start to use in your life today! Develop your insight through specific how-to exercises. Apply the information you receive to all aspects of your life. 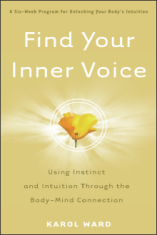 Find Your Inner Voice shows you how you can start start trusting your instinct and intuition again, and use them to to make more fulfilling life choices.